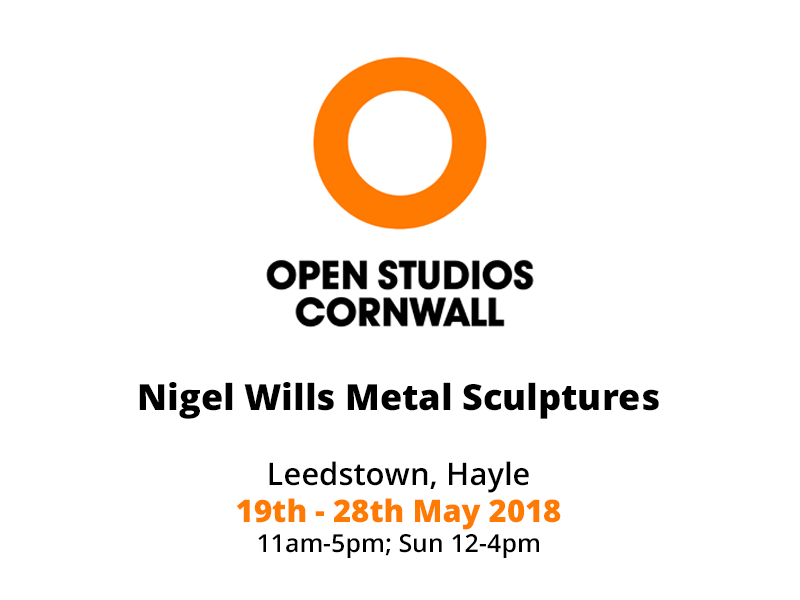 We are excited to be opening our doors for a week from Sat 19th May – Mon 28th May as we take part in the ‘Open Studios Cornwall’ event, welcoming visitors to come in meet Nigel as well as view some of Nigel’s metal sculptures. We will be open from 11am until 5pm from Saturday 19th until Monday 28th May, aside from Sundays when we will be open from 12pm until 4pm. Find out where we are and more details about our involvement in Open Studios Cornwall, or via our website contact us directly here. Visitors can tour undiscovered corners of the county, exploring unusual studios spaces from remote cottages and chapels to beach side galleries and historic buildings. For details of all the participating artists across Cornwall, or to book your place in a workshop, you can visit www.openstudioscornwall.co.uk.